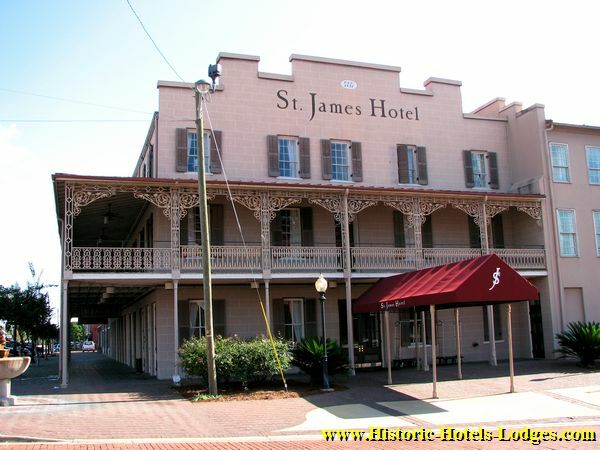 The St. James Hotel is the South's Only Remaining Antebellum Riverfront Hotel. Plantation owners, Union Soldiers, and the notorious, Frank and Jesse James, have slept here. Perched on the bank of the Alabama River in Selma, Alabama, the St. James Hotel now anchors the Water Avenue Historic District and brings historical authenticity, community spirit, and good old Southern charm together to create a true treasure. Built in 1837, the renovation of this grand hotel was a 6 million dollar project that brought together the small community of Selma, Alabama, in a joint effort to save historical authenticity along with a touch of Southern charm.The beautifully furnished antebellum structure has been recreated after months of painstaking research to restore the St. James to its original glory. Vintage lighting, original fireplace mantles, transom windows, rich wood flooring, and delicate antiques all come together to recreate the era of Plantation owners and gracious Old South living.Whether you're a history buff, a lover of fine antiques, or simply appreciative of the finer things in life, you'll find a place especially for you at the St. James Hotel.